On March 7, Lynne Stewart died peacefully at her home in her beloved Brooklyn with her family at her side. 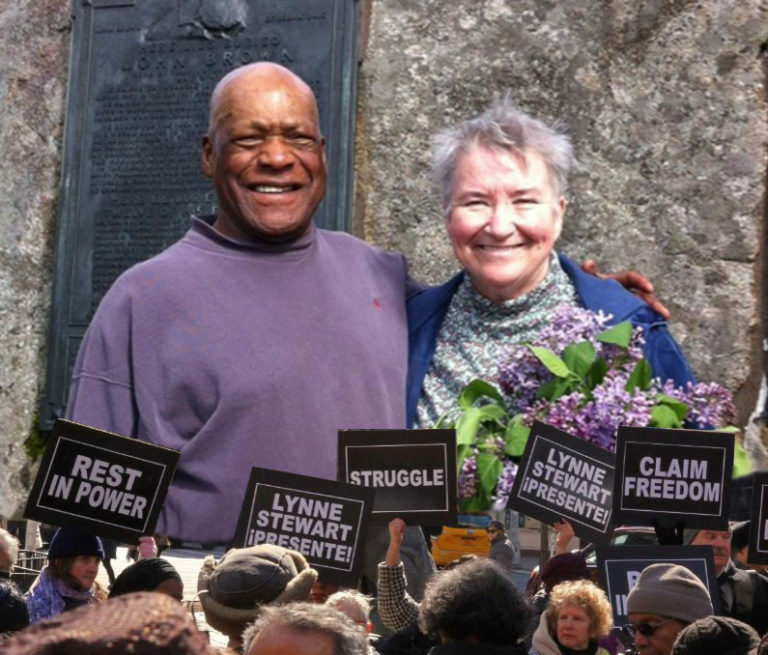 As many know, Lynne was ordered released from federal prison on Dec. 31, 2013 after a legal and political campaign to win her compassionate release due to her ongoing battle with breast cancer. Doctors from both behind the wall and in the street predicted she would succumb to the disease in six to 18 months. 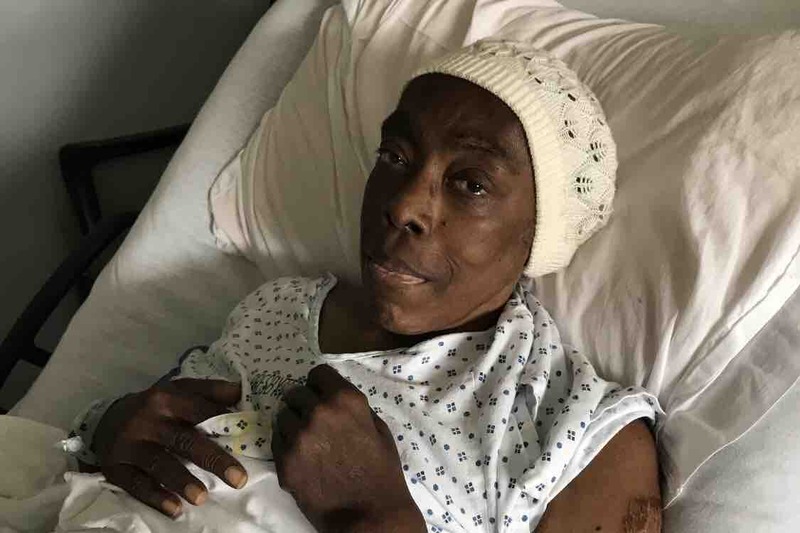 Through strength and determination, she lived for more than 36 months and was able to spend time with family and continue the work for justice that characterized her entire life. I first came to know of Lynne in the 1980s when she defended one of several black and white activists charged with violating RICO laws. Her skill won an acquittal for her client, Bilal Sunni Ali. In 1985, we both were part of a defense team for a group of white activists who became known as the “Ohio 7” on trial in Brooklyn federal court. Working with Lynne and the other members of the team, including Bill Kunstler and Liz Fink, both also gone, was an education for me that no law school or CLE could come close to duplicating. What many do not know is that Lynne was a “full service” lawyer. If you were her client, she not only fought brilliantly in court, she felt it was her responsibility to take care of her clients’ needs: clothes, making sure the clients had commissary money, facilitating visits with family. On more than one occasion, she hired former clients or members of their family to work in her office when they had no other income. At other times, she took clients and/or the children of clients into her home when they had no place to go. Lynne had a big heart. 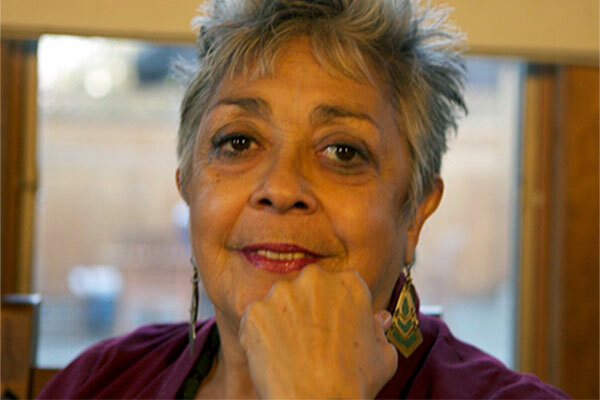 Since her release and especially in the last few months of her life, Lynne and her husband and partner Ralph Poynter increasingly urged those of us in the activist-lawyer community to dedicate ourselves to fighting racism and injustice. Our finest tribute to Lynne will be to make that a reality. I heard the news about your passing; but now I’m not quite sure. After a wave of sadness, I called Ralph. Although his voice was somber, his words were strong and determined. “We have to double our efforts to get all of our sisters and brothers out of prison!” I listened compassionately. He was giving me orders! Marching orders! Lynne’s orders! I sat for a moment processing our conversation. Daggone you Lynne Stewart – frontline warrior, wife warrior, mother warrior, attorney warrior, friend warrior, warrior warrior; in the courtroom sitting when you were expected to stand and standing when they wanted you to sit; advocating and objecting to the judge’s injustices. From prison you wrote me, Jihad, you need to organize the Muslims to get Imam Jamil, Maumin, Jalil, Aafia Siddiqui, and all the other Muslim Political Prisoners out. Form a Muslim Caucus! Get them involved! We gotta do something more than what we are doing! After a Ralph-led full frontal assault, they let you out of prison with the high expectation of 18 months to live. You cheated death then and you’re cheating it now. You’re not dead; you’re very much alive. You are living through each and every one of us who continues to struggle against any and all forms of injustice, state violence, racism, oppression, exploitation, and inhumanity. We hear your laughter and pointed remarks; your courageous analysis, your courageous actions, your courageous presence speaking truth to a tyrant, any tyrant. You were not afraid to call an ace an ace, a chump a chump, a friend a friend and an enemy an enemy. I pray I have that spark when I reach 77. (I’m still not sure whether you and Ralph were serious when we were at the ABC Conference in Colorado a few years ago and you said you wanted to get up early in the morning and work out and exercise with me). Thank you for representing us; for taking our cases; for demanding the freedom of all Political Prisoners. Thank you for being there! You and that brotherman of yours. You are such a profound inspiration. Keep on giving them orders and we’ll talk again soon! With a sunny sky outside, and a “Day Without Woman Strikes” and other very positive and powerful events taking place all across the United States and around the world, I am sitting quietly and sadly reflecting on the life of my friend Lynne, who died last night. There is so much that can, and probably will be said about this dynamic and wonderful woman. 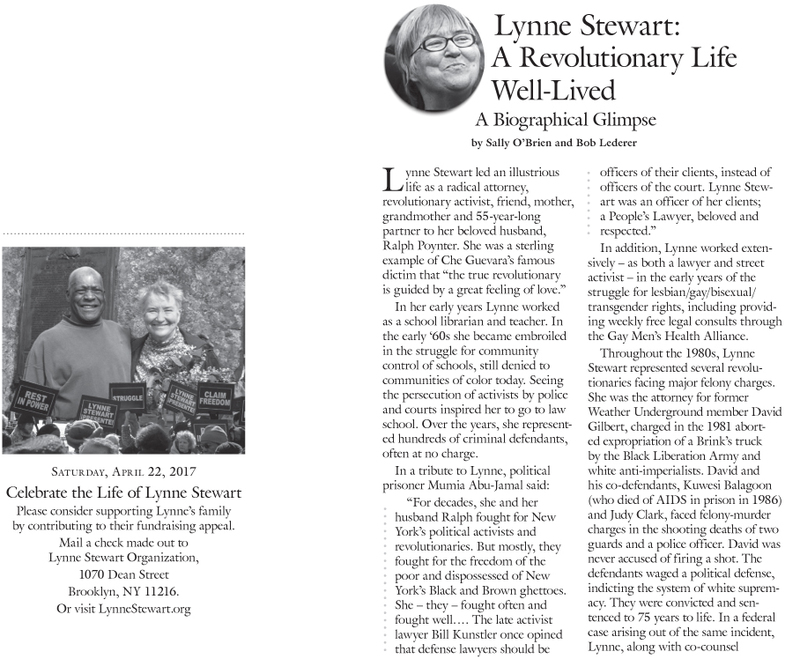 For decade Lynne Stewart was a, if not the, preeminent human rights, civil rights, peoples’ lawyer, boldly fighting for justice, equality, and freedom in many of the most important and widely reported cases in the United States. Lynne truly was fearless and could not be intimidated by prosecutors, judges or FBI and other gun-toting goons. She believed in, and fought for Constitutional rights and equal justice. She always fought for her clients. Lynne was not only brave and determined, but she was a brilliant attorney. She also was very hard working, doing the necessary research and innovative paperwork that often forced the courts to accept her arguments. Lynne touched so many people and lives in large and dynamic ways, in personal, caring and nurturing ways. As a lawyer, Lynne was a very significant part of the legal team for all of us Ohio-7 people in our many trials. Beyond just her work and skill as an attorney, Lynne was also there for our children and families. As a small boy, my son Ricky always stayed at Lynne’s home when he came to visit me and his mother while we were being held in MCC New York. Lynne was our family friend, as well as a sister and a comrade in the struggle. So many people will miss you, Lynne, your guidance and wisdom, your concern and care. the love you had for the people and the freedom struggle is only matched by the love so many people, freedom fighters included, have and will continue, to have for you. Rest easy my sister. We will shed our tears for you then firm up our hearts and spirits and continue in the revolutionary freedom and justice struggle that you contributed so much and uniquely to. Are big lies alternative facts? Can warmongers win peace prizes? Are Mothers older than daughters? If you die, do you come back the next day? But never quietly into the night! Stewart, originally sentenced to 28 months in prison, was resentenced on July 10, 2010, to 10 years in prison, but continued to fight a government frame-up. After suffering a major stroke on March 1, Lynne Stewart died Tuesday evening at home, after being granted a compassionate release from prison three years ago due to fourth-stage breast cancer. Stewart devoted her law practice to defending the poor, underprivileged, unwanted and forgotten, according to her partner Ralph Poynter. The human rights attorney was arrested on April 9, 2002, on charges of helping pass messages from her client, Sheikh Omar Abdel-Rahman, an Egyptian cleric convicted of masterminding the 1993 World Trade Center attack in New York City, to his followers in al-Gama’a al-Islamiyya, an organization designated as a foreign terrorist organization by the U.S.
Stewart was subsequently convicted for conspiracy and providing material support to terrorists, while her felony conviction led to her automatic disbarment. Her sentence was characterized by many as an attempt by the U.S. government to silence dissent, curtail vigorous defense by lawyers, instill fear in those who seek to help Arabs and Muslims being prosecuted for free speech and defend the rights of all oppressed people. Stewart fought false accusations and a government frame-up. Originally sentenced to 28 months in prison, she was resentenced on July 10, 2010 — in an unprecedented move after her bail was suddenly revoked — to 10 years in prison for showing an alleged lack of remorse after her initial sentencing. 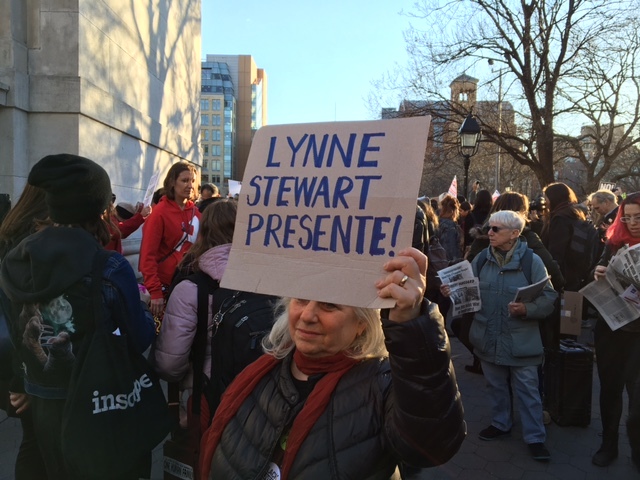 Photo from International Womens Day March: Lynne Stewart Presente! 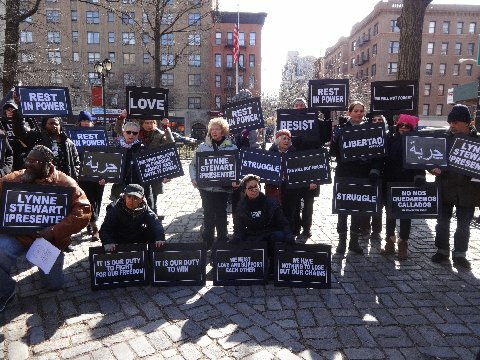 Posted in **TRIBUTES**, LATEST NEWS | Comments Off on Photo from International Womens Day March: Lynne Stewart Presente! I have known a hero in my lifetime, I have laughed with and cried with and shared the righteous rage with a hero. I got to hug a hero, stand at her wedding and find shelter in her home. See her babies grow up and eat pie with her. She casts no shadows, only light now. A woman who gave herself to struggle for decades. A heart, a strong and loving heart that beat so hard for so many, death cannot stop it. Her spirit goes to the reward for loving warriors, there is a significant part of her city, and the nation and beyond that, who feels this loss tonight. Oh captain, my captain. We salute Lynne Stewart, longtime friend of CCR, who was the very definition of a people’s lawyer and who passed away yesterday. We send our love and condolences to her partner Ralph Poynter, who was always by Lynne’s side everywhere she went, and to her entire family. We were honored to have Lynne as a guest speaker at several recent CCR events, including the Law for Black Lives convening in 2015. Lynne exuded love and fiercely advocated for justice, and CCR aspires to that example which she set for all of us. During the 20 years of my Revolutionary Sabbatical, there wasn’t a birthday of mine that Lynne forgot. To me it was always my personal New Year’s greeting from her. I have shared many memories in my life with her. She was always there with unconditional love, support from her revolutionary heart and soul. 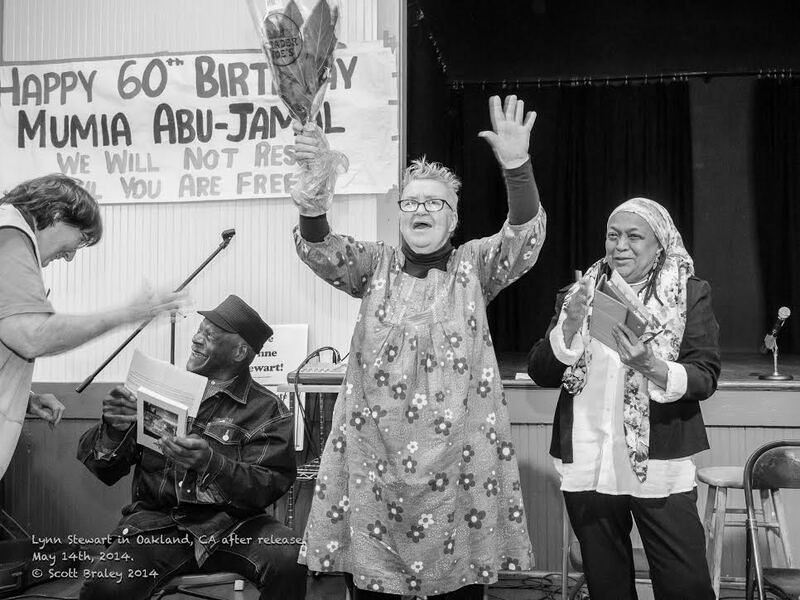 She is truly a woman warrior because what took precedence in her life was struggle for human rights, Political Prisoners in all of the movements of true struggle. There was Lynne. Her smile and eyes were always filled with determination striving for a victorious result. I am very fortunate to have had her in my life. The distance of time and place didn’t matter – I knew she was there.